TraySafe password manager allows you to forget passwords! It will save and protect them for you: encryption and hashing algorithms, autoinsert and autofill, hardware ID, USB drive support. You can forget passwords and you will not lose them! Password Manager makes it possible to generate secure passwords (combination from letters and numbers of length from 4 to 50 symbols) or to preserve the already existing passwords. All information is encrypted with one master password. Softabar Password Manager is a tool for managing usernames and passwords to various services such as Internet emails, online shops, web servers and other accounts. The easy to use user interface helps you to keep your passwords in order. 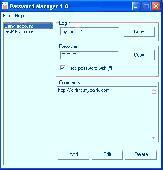 MCS Password Manager 2008 is a software to remember all passwords, notes in safe method. One, main password - it's all what you need! You have problems with remember all your passwords, accounts, PIN numbers? Check out MCS Password Manager 2008!